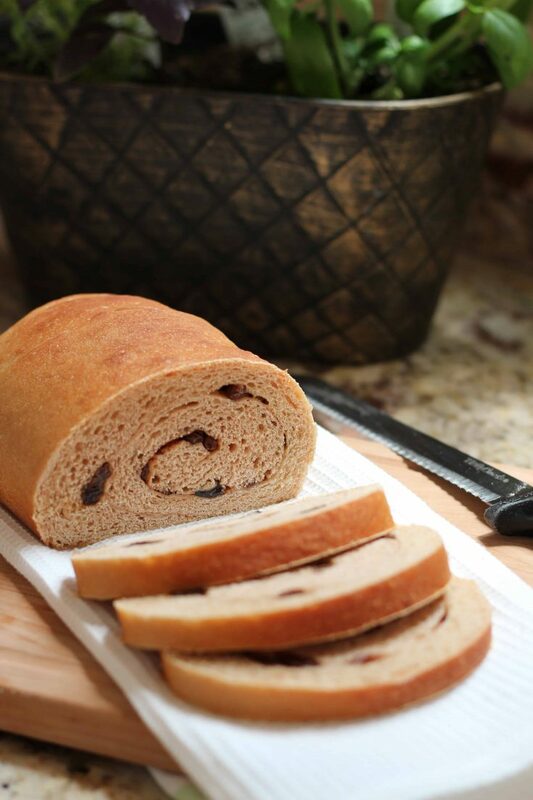 Whole wheat raisin bread– does it compare to my son’s favorite? I think it comes pretty close, if I do say so myself. My son loves Pepperidge Farm raisin bread. I do too. I don’t like, though, that I can’t pronounce some of the ingredients listed on the package. I know that there is more added to commercial bread than the basics of yeast, salt, and flour. It may be necessary to add enhancers to the bread on our grocery shelves but at home you have the privilege of baking with ingredients you recognize. This is not to say that raisin bread is a health food, but I like the idea of showing my little guy how bread is made and teaching him that all food doesn’t have to come from a factory. 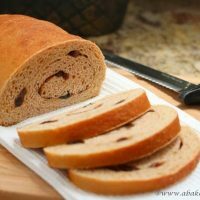 I found this recipe for raisin bread with the addition of whole wheat on the Food Network site. While I don’t think my dough rose quite as much as it could have, this recipe produced two beautiful loaves of raisin bread. And the smell of freshly-baked bread at home is worth the effort. Next time I’ll add more raisins and I will perfect the technique of tightly rolling the dough when forming the loaves. Please click through to Food Network for the original recipe. Click through for the full directions from Food Network. I like raisin bread best without the raisins. I guess that’s called cinnamon bread, but if I were to eat a raisin, it would be in a loaf of yours. Beautiful loaves Holly. Thanks, Karen, I do like the version with just brown sugar and cinnamon too. Hope your week is off to a good start! The smell in the house made it worth it to make this bread at home. Yum! I could eat this every single day for breakfast! The next time I make this bread I’ll have to bring some to you. I love that Pepperidge Farm bread also. Pinned. I can only imagine how amazing your house smelled as these were baking. I love raisin bread! yes, isn’t one of the best parts of baking bread at home the smell in the house? When it wafts up to the second floor I know I’ve baked something good! Thanks, Sally. When my son was younger he also loved Pepperidge Farm raisin bread. It tastes yummy but it is a little scary how long it can sit in a bread box and still taste fresh….I mean, months. I love that by baking with your son you are showing him that bread doesn’t start out in a plastic bag. 🙂 Your cinnamon bread looks delicious. I am curious to try it with the whole wheat flour. I’ve recently read a book called Pandora’s Lunchbox and in it the author describes certain foods that really do last way too long because of all of the preservatives in the ingredient list. Homemade bread might not last as long (and is certainly not low fat or calorie free) but it sure does taste good! Thanks for stopping by, Wendy.